Rosa - The New Brawl Stars Brawlers [Quick Look] | Brawl Stars UP! 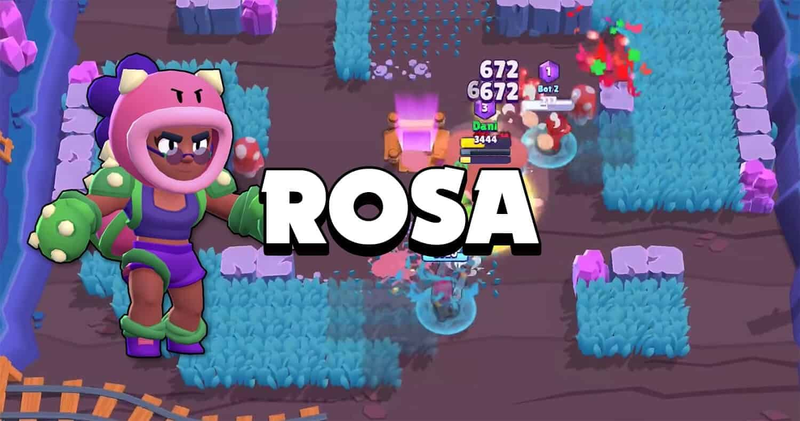 In the next incredible Brawl Stars update, we are going to get a lot of tweaks, new skins and especially a new brawler, Rosa! Rosa was just a normal botanist, who had a huge love for the plants. It was until she got attacked by the bushes (not sure if it’s Bull or Shelly) and she finally survived by punching them in their faces. She also managed to learn some unique skills. Attack Radius: 1→3 fan Rarity: ??? Star PowerRosa gains 300 HP per second when hiding in bush. Her main attack works basically like El Primo‘s basic attack, however it is a lot wider. It’s not very easy to go around her to avoid the attacks, like what you can do with El Primo. However, it looks like she can hit a target only once per punch. Her basic attack throws out 3 quick punches, dealing 672 damage each. This means that she literally has the highest DPS attack in Brawl Stars! The attack range is about 3.3 tiles. This is the 2nd lowest attack ranger in the game, only longer than El Primo basic attack. The reload speed is 1.2s. This is the fatest reload speed in the game right now besides Bull having the Star Power. Her Super is also a new mechanic of Brawl Stars. Once activated, the super gives her a super strong armor, which is made from tough vines. The armor decreases all of the incoming damage by a lot. Making her a super tank of the game. It decreases up to 80% of the incoming damage to her, which is insane! Fun fact: If this does not get nerf, it takes up to 12 complete Bull attacks to take her out while having the shield enabled. The Star Power helps her regain HP immediately once she gets into a bush (how crazy it is?). Speed: 300 HP / Sec. This makes her one of the the strongest tankers of Brawl Stars. With 7,000 HP, Rosa has the 4th highest HP in the game, just barely under Bull (7280 HP). It’s super hard to deal with her in the bush and take her out since she has the insane healing speed and with her Super enabled. Check out the video to see more contents of the update! She is gonna be a very easy to use Brawler. She will be very overwhelming in the lower trophy areas for sure.